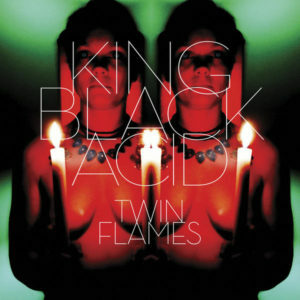 King Black Acid started as a bedroom project for song writer and multi-instrumentalist Daniel Riddle. Over the course of a few years, it has evolved into a full band, often with a revolving cast, dependent on Riddle’s own musical needs. Past King Black Acid alum have included Pigface’s Joseph Trump, Scott Adamo of the Wipers and Richmond Fontaine’s Dan Eccles. Perhaps it is the Richmond Fontaine connection that informs the retro and heartfelt sound that runs through the veins of 2017’s ‘Twin Flames’ EP, although this isn’t strictly Americana. There are elements of such music – chiefly via the title cut’s fixation with Neil Young & Crazy Horse – but there are also huge nods to classic prog rock, a touch of desert rock and even a vague gothy quality to one of the tracks. You could glibly call it a mixed bag, but there’s something very coherent about the end result – and while King Black Acid mightn’t make music that’s inherently catchy, there’s something about the result that’s almost timeless. This is music played with such emotion and love, that no amount of discursive language will actually get across the feelings that emerge whilst listening. That might sound like hype, but this really is music to savour…and emerging from a world where there’s new music around every corner and people don’t spend anywhere near as long listening to new acquisitions as they once did, the very idea that this encourages you to immerse yourself in every note can only be a good thing. The title track begins the EP in a maudlin fashion – King Black Acid’s material knows no other way. Atop a slow riff that blends acoustic elements with a haunting Americana themed slide guitar, heavily treated vocals and an almost prog-ish atmosphere, there’s a stark contrast between its main styles. One thing’s for certain, though: this semi-mopey, yet warm musical bubble feels like like a soundtrack with which to contemplate the world. The melodies amble along, taking huge cues from 70s rock – chiefly Neil Young & Crazy Horse and a pseudo-Floyd ambience. More modern hints of psychedelia occasionally suggest the spacier elements of Band of Horses, while the hefty bass links everything with a stately presence. There’s no real hook, although various la-la’s used as melodic filler have a habit of creeping into the subconscious. The extensive use of vocal treatments makes it hard to work out any real message within the lyric, but the music is so thoughtfully arranged, the piece kind of speaks for itself. It’s one of those numbers where if you get what the band are doing, you’ll fall in love with it almost instantly. ‘Headfull of You’ (sic) pushes the acoustic guitar to the fore during the intro, before the drums and a heavy echoing electric lead guitar take over. It’s easy to be reminded of Young’s ‘Cortez The Killer’ on first hearing, or perhaps even the mellower (and tidier) offerings by Trevor and The Joneses. Subsequent listens unveil the work of a band with more of their own vision and it’s another track where the atmosphere built up is almost more important than any real or lasting hooks. This time out, however, the vocal is allowed a more natural place and the heartfelt performance is perfect for the slow and rolling groove, while the loud presence of the drums anchors everything just enough for the flowing spirit not to flow too far into mere meandering. Fans of later Wilco might find some kinship, while lovers of seventies album fillers aplenty will certainly find something of their own to latch on to. There’s a feeling that each individual pair of ears will hear something different, but it’s another track to really lose yourselves in. With a great deal already pointing to this being a terrific release, ‘Waiting For The Sun’ blows everything out of the water. This psuedo-prog rock epic presents a slow and hazy riff, leaning towards a darker desert vibe. Its pacing draws directly from thoughtful 70s prog rock and is an interesting extension of King Black Acid’s previous sounds. More than just a retro throwback, there’s a quiet contemporary heart thanks to a wonderfully warm production. The bass and keys mesh together in a perfect harmony as the tune slowly unfolds – this EP never rushes anything – and looking beyond the main groove, it’s the haunting presence of an occasional acoustic piano that really gives this it’s most memorable flourishes. How the deeply crooned voice – again, tempered by filters – ended up sounding like a lighter version of Type O Negative circa ‘October Rust’, well, that’s anyone’s guess. It certainly gives things an unexpected twist. As the once mellow sounds rise up for a full bodied climax, the main riff adopts a slightly heavier sound, while more synths add spacey vibes and a reverbed slide guitar makes everything feel even more like a voyage into a psychedelic country. Like an extension of ideas and musical themes from Devin Townsend’s Casualties of Cool project, this track is a must hear. There may only be the three songs, but ‘Twin Flames’ (the EP) represents just over twenty minutes of perfection. The songs might not be immediate, but the production values, the musicianship and the overall sound has a timeless wonder that inspires and transports the listener to a far away place of their own imagination. You’d be a fool to miss it. This entry was posted in Album & EP Reviews and tagged atmospheric rock, daniel riddle, king black acid, pigface, prog, richmond fontaine, rock, stoner by Real Gone. Bookmark the permalink.